IMPROVING health literacy among refugee populations requires a collaborative, multidisciplinary approach, say experts who have called for greater support for clinicians in adopting novel ways to respond to low health literacy. Writing in the Medical Journal of Australia this week, researchers said health literacy was more than just access to information. “It is about people having the confidence, support and resources to manage their health,” they said. They added that clinicians working with diverse communities needed greater support from health services to enable them to develop “stronger local service partnerships that broaden access to existing community and local resources”. Dr Aesen Thambiran, chair of the Royal Australian College of General Practitioners’ (RACGP) refugee health specific interest group and a GP in a refugee service in Perth, agreed that a broader, collaborative approach to health literacy was required. “We need to move away from this idea that health literacy is just about giving information and being able to read pamphlets and communicating with interpreters. It’s a much broader thing; it involves enhancing a person’s cognitive and social skills, which enable them to be motivated and empowered to improve their own health,” he said. However, he added, the practicalities of implementing such an approach presented a “huge challenge”. Dr Thambiran said current efforts to improve health literacy were often hampered by the fragmentation of the health system, including the usual barriers around federal and state funding. Dr Christine Phillips, associate professor of social foundations of medicine at the Australian National University, said while the MJA article pointed out areas in which improvement in health literacy measures was needed, it was important to note that, among the 25 countries with offshore refugee resettlement programs, Australia probably “does it better than most”. Newly arrived refugees in Australia were provided with 510 hours of free English tuition, which included a health literacy component, said Dr Phillips, who is also medical director of the ACT’s refugee health service. But she said there was room for improvement and newly arrived refugees were at the highest risk of falling through the cracks of the health care system. “If there are any gaps [in the health care system] … a newly arrived refugee will be the one who falls through [them]. They are like the people who map out the fault lines in a health system,” Dr Phillips told MJA InSight. Dr Phillips said Australia’s free national Translating and Interpreting Service (TIS) was “extraordinary” in providing phone access to interpreters in 160 languages, mostly within 3 minutes, but it remained an underused service. Dr Phillips pointed to 2011 research, of which she was an author, which found that the TIS was accessed for patients with poor proficiency in English in less than 1 in 100 Medicare-funded consultations (0.97%). This finding was recently confirmed by BEACH (Bettering the Evaluation and Care of Health) data, she said. Dr Phillips said the general practice accreditation requirement to have systems in place to access interpreting services ensured that GPs were at the forefront in using this service, but its use was less well understood in specialist practices, the public health sector and areas such as pharmacy. Dr Phillips encouraged pharmacists to register to use the TIS, adding that the prescription repeat system remained one of the more obscure elements of the health system to many people with low levels of functional literacy, including refugees. Dr Thambiran agreed that the TIS provided an invaluable, but underused, service. “Part of it is the practitioner … not fully appreciating that while someone may have a little bit of functional English, they might not have full grasp of what’s being said, especially when it comes to medical terminology”, he said. He also cautioned clinicians against using friends and relatives as informal interpreters, as this was “hugely problematic” in terms of accuracy, confidentiality and, often, disrupted family dynamics. Both Dr Phillips and Dr Thambiran said the teach-back method — where a patient is asked to repeat health information to the practitioner in the patient’s own words — was a highly effective communication tool that should be more widely used with refugees, and employed more generally. “We probably don’t do it enough and we should be encouraging clinicians to use it more often,” Dr Thambiran said. Michal Morris, general manager of the Centre for Culture, Ethnicity and Health, called for teach-back to be taught at the undergraduate level to encourage greater use. She said time was often a barrier to the implementation of such techniques, but the initial time invested in checking a refugee patient’s comprehension would be quickly regained in terms of better outcomes and compliance. “Health literacy provides an opportunity for us to rethink how we are communicating, and to add that extra element to really test comprehension”, she said. Ms Morris said that while health literacy was currently addressed at the federal level as a safety and quality measure, it should also be addressed across all settings, including undergraduate education and continuing professional development. “Health literacy [education] is not just for the clinician’s room. It has to take place where people make their health decisions, whether that’s sitting around the family table or whether it’s impacted by the nurse, by the settlement worker, as well as the doctor,” she said. At The Water Well Project, we are aware that poor health literacy is linked to poor health outcomes in refugee and asylum seeker populations. Our organisation is a health literacy organisation, which strongly believes that by empowering individuals, they are able to take greater responsibility to attaining and maintaining their health. 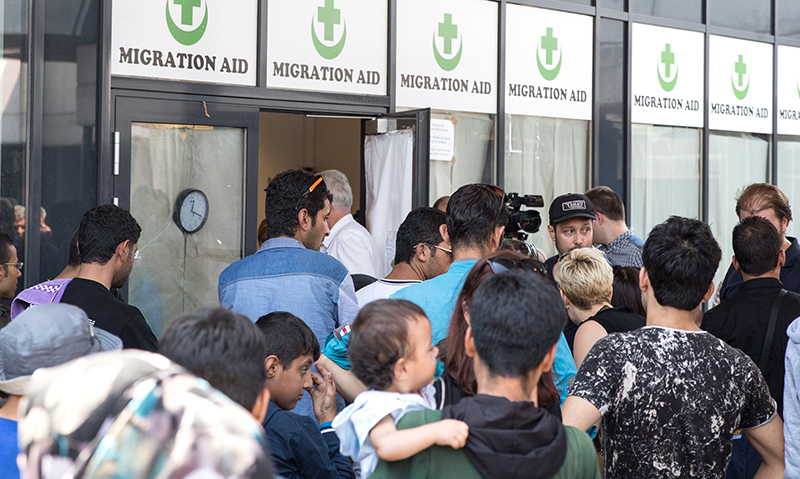 We take referrals from organisations which work within the refugee support sector. Volunteer healthcare professionals provide free, interactive health information sessions. An open dialogue is encouraged between our volunteers and the community participants. As such, Powerpoint presentations are discouraged to maximise interactivity. Our volunteers are all qualified healthcare professionals and come from diverse backgrounds including doctors, nursing, midwifery, dentistry and other allied health disciplines. Sessions include but are not limited to navigating the Australian healthcare system, healthy eating and nutrition, women’s health and children’s health topics. To date, The Water Well Project has delivered more than 190 sessions with the support of volunteers, public donations and grants. It is estimated that these sessions have reached approximately 2,500 individuals with flow-on effects to their family and friends. The Water Well Project was proud to be recognised in the Victorian Government’s Victorian Refugee and Asylum Seeker Action Plan 2014-2018 and to be named as finalists in the 2014 Melbourne Awards for Community Contribution. We believe that this is formal recognition of the important service The Water Well Project is providing across Victoria.